Pan-fried mild green chiles and red bell peppers with garlic (pimientos fritos con ajo) make this easy tapa as you might see offered in Spain along with slices of rustic bread. This simple dish packs lots of flavor and not much prep work. You just have to clean and cut the peppers into large squares and fry them with garlic. Peppers make an appearance in many Spanish dishes. When peppers ripen in summer you will see them not only as tapas but also as a side dish served with meat, pork, and eggs. For this dish, you won't be using typical green bell peppers. Instead, you will use a long, mild green chile such as a green pasilla (or poblano) chile or green Anaheim chiles. These are paired with sweet red bell peppers. Anaheim chiles may be familiar because they are often used to make the classic stuffed pepper dish, chiles rellenos. They have a mild heat of 500 to 2,500 on the Scoville scale. Pasilla chiles are often stuffed as well. They range from 1,000 to 2,000 units on the Scoville scale. What heat they have is concentrated in the seeds and veins, which you will remove, leaving the flavorful flesh. In a pinch, you could substitute green bell peppers, but it would be less authentic (and likely less flavorful) to what you might find in Spain. Rinse the peppers and cut off the stems. Slice the peppers in half lengthwise and remove the seeds and veins, discarding them. Then, cut the flesh of the peppers into large pieces. You should end up with pieces about 1.5-inches square. Peel all the garlic cloves and cut each one in half. In a large frying pan, add the olive oil and warm it to medium-high heat. 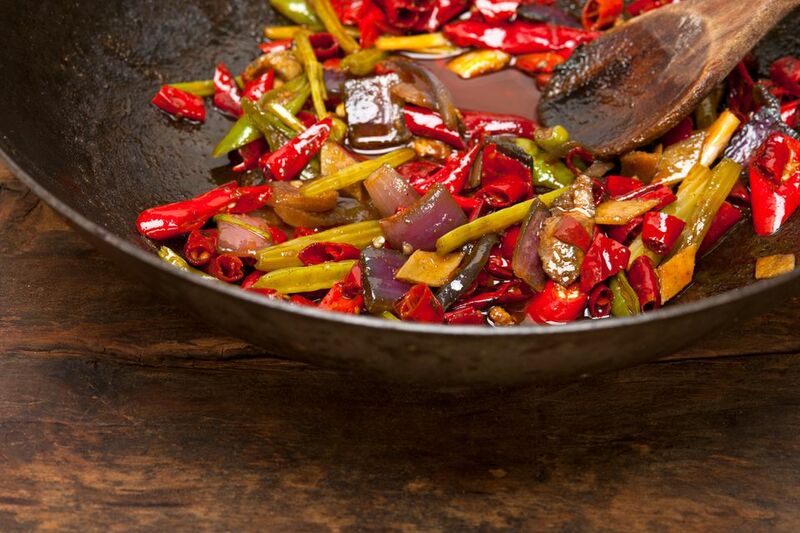 When the oil is hot, put the peppers and garlic into the frying pan and fry. Stir often, until peppers are soft. Avoid letting the garlic burn but constant stirring. Remove the peppers from the pan and place in a serving dish. To serve as a tapa, spoon some of the peppers onto slices of crusty, rustic bread. Or, arrange slices of bread around a bowl of the peppers and provide a spoon for your guests to top the bread slices themselves. The peppers can be served warm or cold. Store any leftovers, covered, in the refrigerator for up to a week. The fried peppers can also be frozen. Place them in a freezer container or bag, label it with the date and contents, and add a "use by" date one year in advance. When you want to use the frozen peppers, thaw them in the refrigerator and use them within three to four days. They will work well as a tapa or side dish when thawed and heated.